We work with many different types of businesses from make-to-stock to engineer-to-order. Each type of business has its own unique capabilities and challenges. Each business model has unique characteristics both in terms of performance, but also on the issues they face. Make to stock businesses have stock immediately available to send to clients so their delivery time is very short, whereas engineer to order businesses cannot start the design until the customer order is received. The ability of the business process to adapt to change in specification depends upon which process is used. For make to stock processes, product specification change has a very high impact as manufacturing processes have been highly geared to product specifications and there will be a very high inventory of finished parts. For assemble to order or configure to order processes, change can take place very rapidly and have minimal impact. The cost of engineering a make-to-stock product is a one-off investment. Whereas the cost of engineering is incurred each time an engineer-to-order project is executed. For assemble-to-order and configure-to-order products, the cost is also made as an up-front investment although there is more work to do. Design errors can occur whenever engineering design occurs. For make-to-stock products, the design will be quickly proven and once established design errors will not occur again. For engineer-to-order projects, the design is always a virtual prototype and therefore, the risk is much higher. 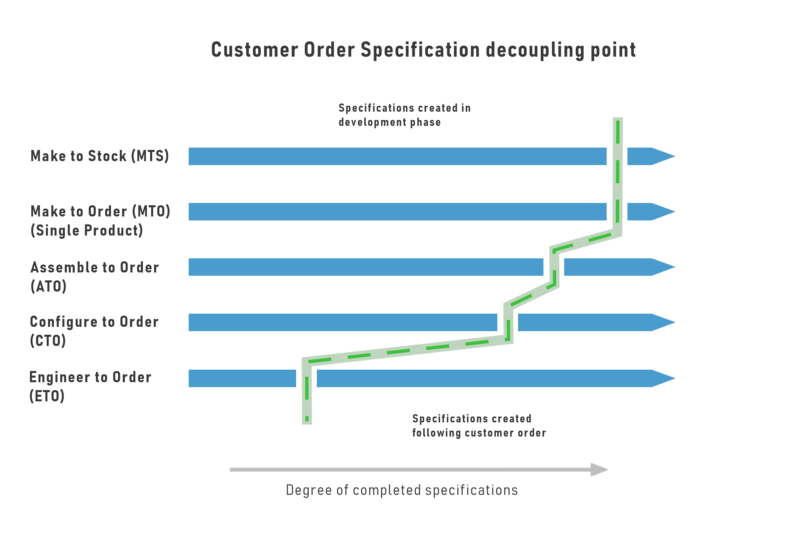 Engineer-to-order projects have very little up-front development requirement as the engineering will not be committed until the receipt of a customer order. Configure-to-order business requires a large up-front investment, however, the return on investment is usually quite short.